Owning a car is supposed to be fun because driving one gives you more freedom to travel from place to place. Driving a car can give you such a rush – why else would people go crazy over car races like Formula One and NASCAR? If you’re the owner of a car dealership, it is that need for speed that you have to convey to each and every customer entering your lot so they would leave your premises sitting behind the wheel of one of your cars. One way you can transmit such a message without saying a word is by decorating your lot with cheerful, colourful automotive flags in Sydney. We are a flag shop that sells outdoor flag and banners online. You won’t see any sad, fading flags on a car racing track. So why should your car dealership have any? 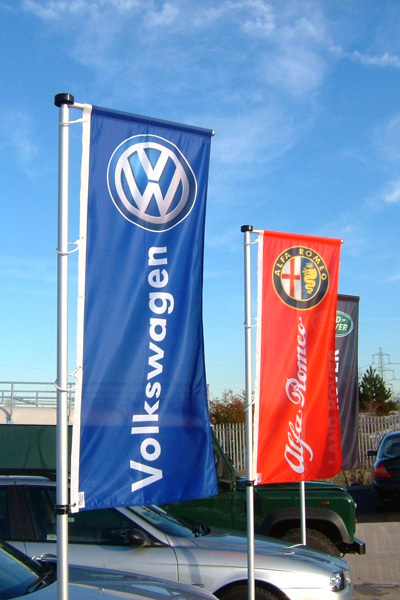 Whatever car flag you hoist up around your lot should be brightly coloured, light enough to flutter invitingly when blown by the wind, yet durable enough that the fabric won’t fade even when exposed to the elements 24/7. That’s exactly the kind of flag you’ll get when you buy your automotive flags from us. Our flags are guaranteed to be high in quality, with rich details and brilliant colours produced through full-colour digital printing. 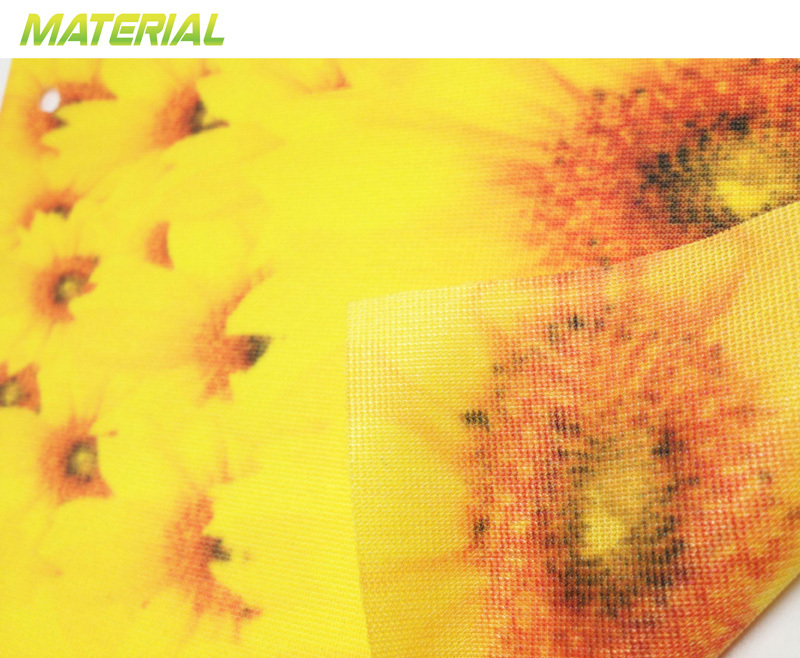 The fabric is made from polyester blends and the printout is fade-proof and damage-proof. It will not easily get scratched, nor will the colours fade away from prolonged exposure to wind, sunlight or moisture. You have many choices when you order your flags online from us. First, you get to choose whether the flag is double-sided or single-sided. 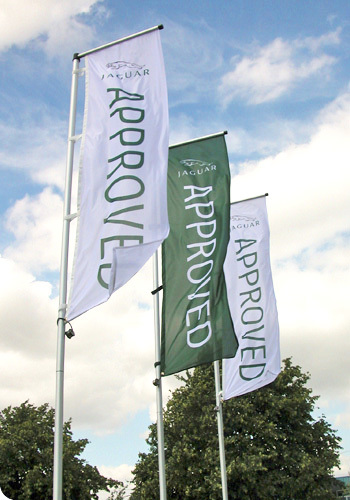 Single-sided flags are great if you only have a small space to allot to any outdoor banners. 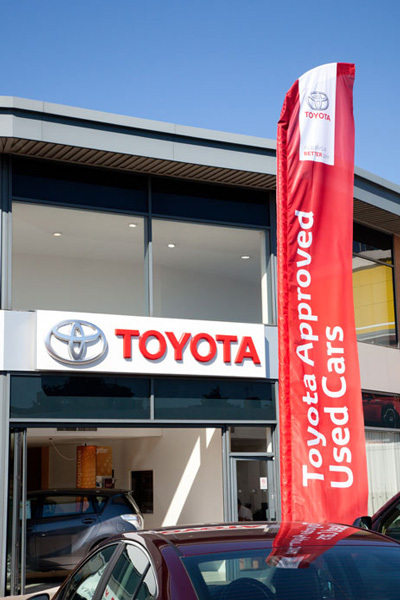 But if you have a big space outside your dealership’s building, double-sided banners are the best because they maximise your brand’s exposure. In addition, you can pick whether the flag should be finished with pockets or eyelets or both. The pockets design allows you to slip a supporting rod into the flag so it stays sturdy against the wind. Eyelets, on the other hand, allow the flag to be attached to the flagpole using rings, thus giving the flag more room to move. Your choice largely depends on the available space you are working with. 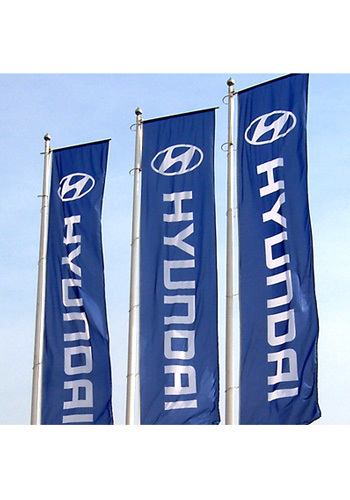 Our automotive flags in Sydney are truly the perfect decor you should have at your car dealership. They make your premises appear more fun and cheerful, and they attract customers to your lot by stimulating in them their need for speed. You don’t need to limit your search for a flag shop in Melbourne. We deliver these flags not just in Melbourne but also in Sydney, Perth, Darwin, Adelaide, Gold Coast, Canberra, Brisbane, and anywhere else in Australia. Get your flags online from us today.